As much as remote jobs, side income, part-time jobs go making money blogging is one of the trending engagement by many. Every day, new blogs are spring up every day with the hope of making money blogging but only a handful keeps with compete for a slot in the blogosphere. A recent account noted that there are over 1.4 billion blogs websites existing as of February 2019. As such to stand up and stand out amongst the crowd requires something specials and with a bag of strategy. We want to reveal tried means that have worked for making money blogging, Enjoy. To make money blogging it is necessary that you have your intended reader at heart. Yes, it is your blog and you can do whatever you want with no permission but if it is intended to make money blogging then it is a mistake. However, You can write whatever you want on a personal diary about yourself, family and friends. As a blogger, you do not want to be drawn into tempting ideas because they suit your personal interest or persuasion. To make money blogging, your first and ultimate interest should be Your target audience. Always ask yourself about the interest of your target audience. Do your ideas interest them? what benefit is it to them?. Ask yourself these questions before writing a blog post. unfortunately, most bloggers write what pops up in their head, which will result in wasted time and effort. It is more like having a product that no one is interested in. You do not want to rush off writing anything. To make money blogging make posts that serves your readers’ interest. Every post should be done at the back of audience-based research. In other words, do not second guess or write what pops in your head instead, apply SEO and content tools to research audience-appealing posts. Readers want to feel fulfilled and happy after reading your posts. They feel free without persuasions to come back, share, sign up when they find what they want on your blog. So, providing your readers with their reading needs will help grow your blog. 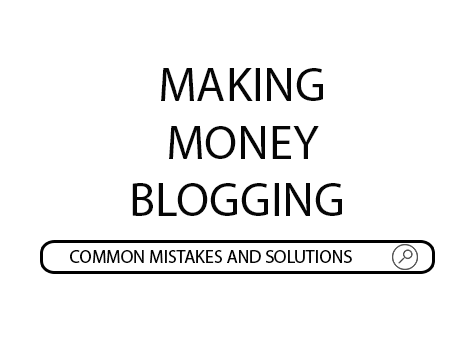 It’s simply making money blogging is proportional to how much value you are adding to the reader. That is why “How-to” contents generate good traffic than average posts. So, might consider writing on post such as “How to open a Gmail account”. I know you will say everyone should know that but on the contrary, a lot of people don’t because of lots of people search for this on a daily basis. Apart from avoiding writing posts that are self-serving, another thing to watch out for is the effect of the post. This is what ensures that readers complete reading of a post on your blog. A post is made below the bar when it is not conversational, lack of white space, grammatical errors, wrong writing tone, and so much more. You want to keep your readers glued to your post because they find it interesting. Most bloggers fall in into this because they tend to sound too official. Write in a conversational way. Always aim to make your post interesting an engaging like some of your interesting novels. I usually advise upcomers to write it as they would say it. Do not sound like some machine, Ensure to add a little bit of humor to your post at intervals but don’t sway of the purpose. Use bullets to nearly itemize steps to bring out steps and break your post into paragraphs. There are rules for making money blogging but adding engaging strategies doesn’t go against it. Finally, there are pluggings that could improve your punctuations and general writing ability. Try Grammarly checker to guide you. Some bloggers have absolutely no specific topic they are known for, they write on everything that is trending with no control. No matter what it is, never cross-blog Except you’re as renown as Huffington Post or the New York Times. Posting random content will create a low level of interest in your blog because you will unable to fully satisfy readers of different inclination. So people will reluctant to sign up for newsletters and search directly for your blog. Plus, there’s no effective way to make money blogging on a generalized blog via search engines. But you work within a niche, you might be able to build a community of readers. It is paramount that you know about your target audience is. Because, the more you know, the better guide you have over the kind of content to blog about and stick to it. Before blogging about a topic it is also important to know the monetization potentials else you might end up in an unprofitable niche. Finally, study the trends of others making money blogging to guide you on choosing a blog niche. The credibility of a blog matters much more than you know. Because searchers are relying on what you write to apply on something. Some bloggers just write based on what they think with no records or proper research authority to back them up. There is no harm in stating that a line in content is based on what you think. But when it comes to arguable fact, be sure to quote data studies, and research to back up your points. People need to be convinced about your stand in a topic so they don’t feel you are just another voice. Before writing a post, be sure to have done some reading about the topic and quote authorities on that topic to further backup you claim. Using data on posts gives your content more weight. It assures readers that thorough research and study was done before publication. Plagiarism is the act of copying someone content without making improvements. If you really want to make money blogging, then this is a must not. Because there are strict penalties to this. There is no place for non-contributors in blogging. Plagiarism is a blogging crime plus, it’s illegal. Google removes sites with duplicated contents from Google index. This means that your blog will be unavailable on search results. Plagiarism has a lot of demerits but in summary, it ruins blog reputation, and revenue. Simply create unique contents that stand out from what has ever been done. Although it takes time, but no pain, no gain and nothing good come easy. When you create unique contents you tend to earn your readers trust, establish yourself as an authority and avoid google penalty. The fact is that research involves reviewing other people’s contents so, to guard against plagiarism use Plagiarism Checker tool to analyze contents before publication. This tool is useful especially if you have freelance writers. Although blogging consistently is encouraged in blogging, but there is no way quality should be traded for quantity to get a high search ranking. So many aims to So, armed with this information, you start to churn out 10 short blog posts every week. Doing this implies you are now trading quality for quantity. The quality of the blog posts you publish is very important. Readers can only visit your blog if you are creating high-quality content not the number of content. The fact is google rank based on blog posts and then the entire blog. As such every post should be researched and done properly. Because users do not care how many other posts there are on your blog but the one that provides a solution to their search.If you have 10 posts you want to make sure they are comprehensive and evergreen. People who are making money blogging know that the money is in making a mail list. As such failure to do so is a deadly mistake. Making money blogging is not all about getting tons of traffic but converting them to subscribers. This can be done by building an email list. Set up your email newsletter and add a CTA so that you can have reader subscribing to your blog. Offer freebies to attract to entice readers to subscribe. Use email marketing tools like MailChimp or ConvertKit. Also, create a landing page getting subscribers via social media and other sources. Building an email list is the best way to create engagements and getting customers. Subscribers are notified whenever new content is published on your blog this prompts repeated visits. Lots of blogs are guilty of bombarding subscribers with product sales and services. And also sending all the blog post on your service. Reader generally feels not concerned when you are only interested in selling your product. The whole essence of blogging is providing service. The goal of service should not be traded for anything. Making money blogging is a step by step process that needs no rush. First, concentrate on proving helpful content before offering products and posts. Search engine optimization is something you should pay attention to. SEO allows users to build an army of traffic and build a better search engine ranking. Write blog posts that are optimized for search engines. If a post is well optimized and beats off competitors, it can stay on the first page of search engines for months and years to come without updates. On the flip side, if you create a post that is not optimized there is are rare chances of anyone seeing it let alone make money from it. If you intend to rely on google ad sense to make money blogging there is no way around this. You need to have a working SEO strategy else you’ve lost out already. Once the right SEO strategy is established, relax and watch your traffic improve with less effort. There are several plugging, and SEO tips that can guide you on your journey to make money blogging. Consistency is key in blogging you will be tried and tested. Keep up when the chips are down to and avoid making common mistakes and listed above. Finally, always research for current SEO practices to keep your self updated with the trends.